Long hot, sunny days, beach time, and an even greater abundance of God’s nourishing and life-giving foods. 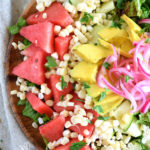 Several of those summer-season eats are brought together for this vibrant Summer Corn and Watermelon Salad with Smoky Dressing. A beautiful rainbow of tender and bitter greens, crunchy and sweet summer produce, creamy and rich avocado, and a smoky, tangy dressing. Quick, whole-food based, raw, vegan, oil-free… all those and more. The summer months bring such rest for me, even if each day is full of activities and work to be done. Maybe it is this particular summer: an incredible time in the Philippines, spending my first summer in the new city after jumping states, and finding myself in the place of physically, mentally, emotionally, and spiritually wellness that God has brought me to. Having farmers’ markets year ’round is such a blessing, and something I haven’t experienced until this last year. There’s just something about hitting the market in the summer when God’s amazing foods are in even greater bounty. I have my stone fruit and apple guy, carrot lady, walnut guy, watermelon lady, and avocado guy that I must hit every week. 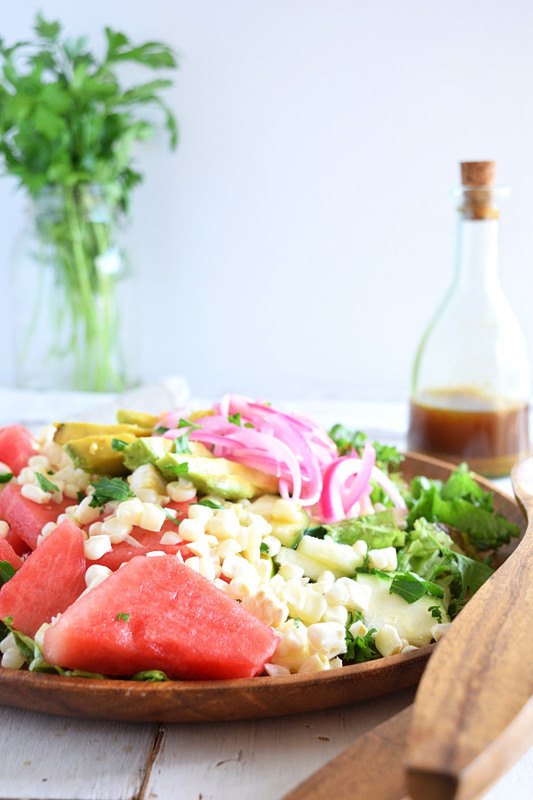 This beautiful, raw summer salad really highlights some of these. Especially the watermelon, which takes me back to being a little girl, eating pounds of it with my family, at a day on the beach, or playing all day outside in the heat with my brothers. I have to thank God and give Him the credit that I’m finally able to relive being able to eat what has always been my favorite fruit. Watermelon was one that I had to give up completely when I developed IBS, having serious digestive issues just 10 or 15 minutes after eating it. Once I began seeking God’s way to heal, I had hopes I would be able to eat it again, but knew I needed to give it up during my healing period. It’s been several years, but this summer I have been able to once again freely enjoy this beloved, cleansing, juicy fruit. Thank you, Lord! All of that to say, I’ve been eating a lot of watermelon this summer. 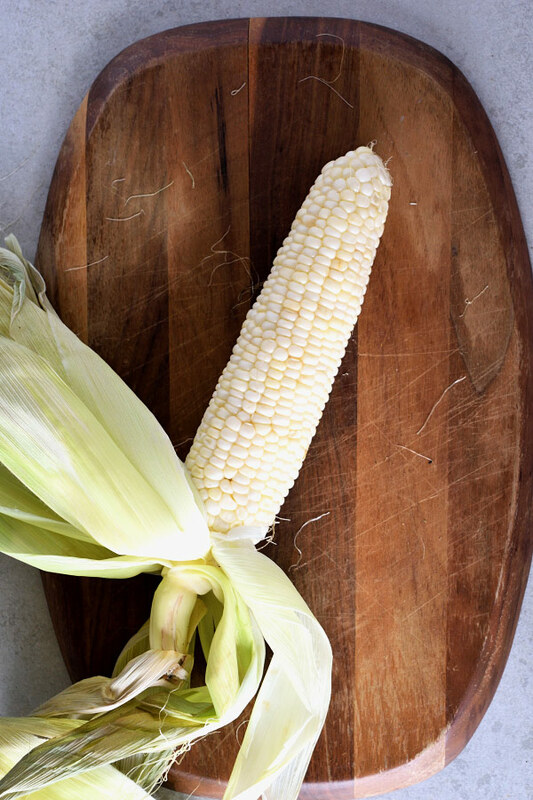 It needed to be featured in a beautiful salad with other summer produce, contrasted with a bed of bitter mustard greens and tender lettuce, crisp and sweet zucchini, burst of corn, creamy avocado, and a smoky yet tangy dressing. What I love is that this salad can be easily adapted. Feel free to use however much, and whichever greens you want and can find most fresh. Use this as a bed to lay all the other ingredients on. 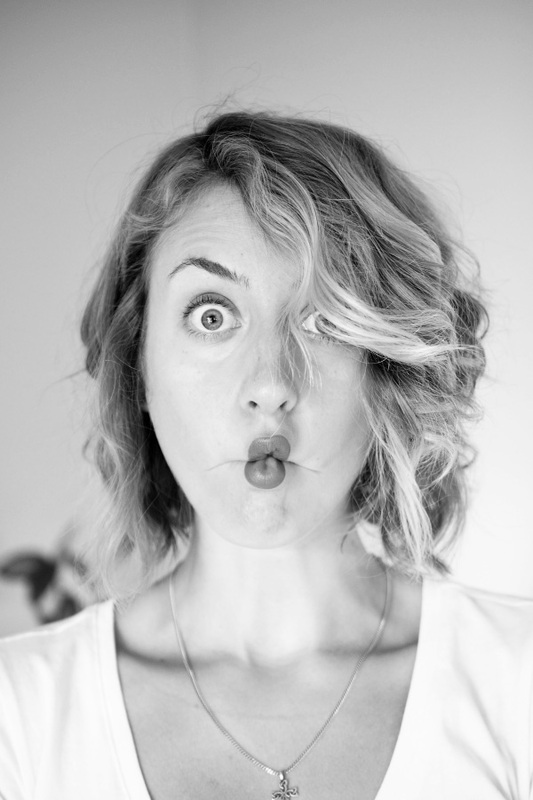 The amounts are completely dependent on what you want; add as much as you like and cut however you like. Small cubes, thin slices (like I did), or bigger chunks. Make as much pickled onion at a time as you like since it can keep in the fridge for weeks, and gets better as it sits. 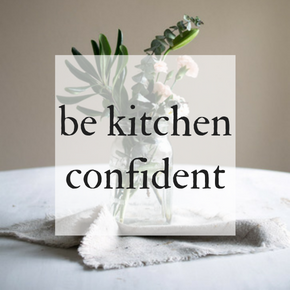 The ratio is this: fill up your bowl of onions halfway with raw ACV and the rest of the way with water, with a pinch of salt. Do not worry if all of it is not submerged as the onions will release water as they sit. Keep in the fridge as a flavorful condiment. The dressing is much like the onions in that you can make however much as you like since it will last in the fridge. Mix about equal parts of the raw ACV, coconut aminos, and water. The spices can be added based on what you like. I simply start sprinkling each in (about 1 teaspoon if you need a reference), tasting it and then adding more if needed. So add additional for your desired smoky taste. A beautiful contrast of tender, bitter greens, crunchy and sweet summer vegetables and watermelon, and a tangy and smoky dressing. Place as many onions as desired in a bowl. Pour in the vinegar until it reaches about halfway up the onions. Fill the rest with water and add salt. Mix the onions and liquid together until broken up. The majority should be fully submerged, but the onions will release water so they do not have to be completely. Refrigerate at least 10-15 minutes and will last at least a week if kept in the fridge. Mix together equal parts raw apple cider vinegar, coconut aminos, and water. Add desired amount of spices, starting with about 1 teaspoon each and adding additional based desired smoky flavor. Finish with a sprinkle of kelp granules and salt. Use as much greens and sliced vegetables, to desired shape and thickness, as you'd like. Begin building your salad by first laying down your greens. 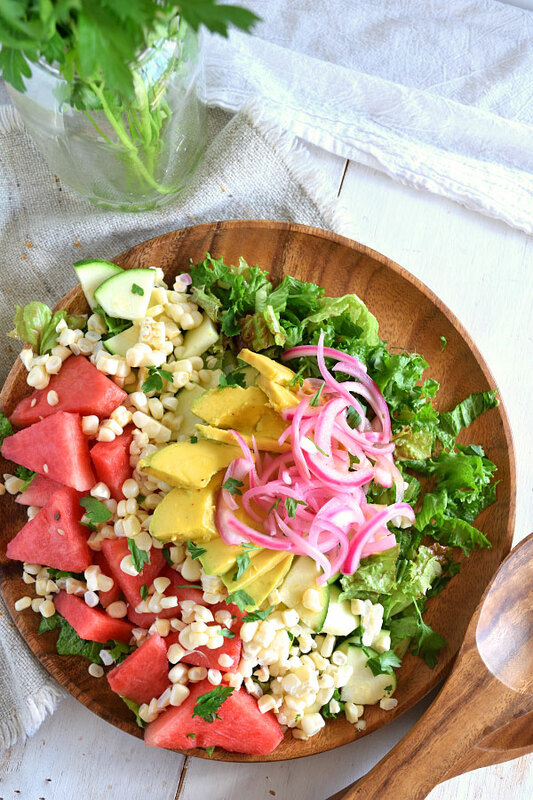 Layer the zucchini, watermelon, and corn. Feel free to use more or less of these than specified. Finish with avocado slices, pickled onions, and dressing. Serve and enjoy! Use whichever greens you can find most fresh, however something with a peppery bite is the perfect contrast to the sweet.